Today’s cake is the result of both my being too lazy to go to the store and the good fortune of having some Guinness in the refrigerator. It’s a great cake – moist, but not too rich to handle a good frosting. The original recipe is adapted from a cake served at Barrington Brewery in Barrington Hill, MA. You can find it on Epicurious. The Epicurious recipe makes one huge cake, so I cut it in half and ended up with just enough batter for a 2 layer 8 inch round cake. I didn’t have any whipped cream, so for the frosting I used a recipe from Cooking With Amy. Since the cake is made with Dutch cocoa, I decided to add some contrast and use natural style cocoa in the frosting. 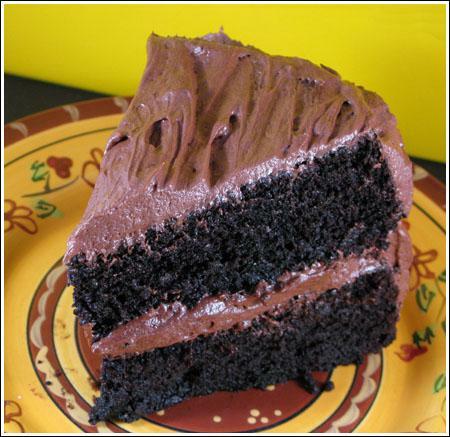 Chocolate Guinness Layer Cake is a rich chocolate cake made with stout. 8 oz butter, softened – I used salted because it was all I had. If using unsalted, you’ll probably need to add a few pinches of salt to icing. Preheat oven to 350 degrees F. Spray two 8-inch round cake pans with flour-added cooking spray. In a large bowl, thoroughly whisk together flour, sugar, baking soda and salt. In a mixing bowl, using an electric mixer, beat eggs until thick and lemon colored – beat for a full five minutes. Add the sour cream and beat until combined. Add the stout mixture to the egg mixture and stir just until mixed. Add the flour mixture and stir until well mixed. Divide the batter equally between the two pans. Bake for 28-32 minutes or until cakes test done (toothpick inserted comes out clean). Cool in pans for 10 minutes, then flip and let cool on a cooling rack. To make the frosting, stir together softened butter, cocoa and 2 cups of the sugar. Add Guinness and vanilla and stir again. Using high speed of electric mixer (I use the whipping attachment on my stand mixer), beat icing for a minute. Add the rest of the sugar, adding just until you think it’s the right consistency. Beat for a good 3-5 minutes, scraping side of bowl often, until light and fluffy. Ice the cake. I think it would work. The results will be a little different, but it should still be a good cake. 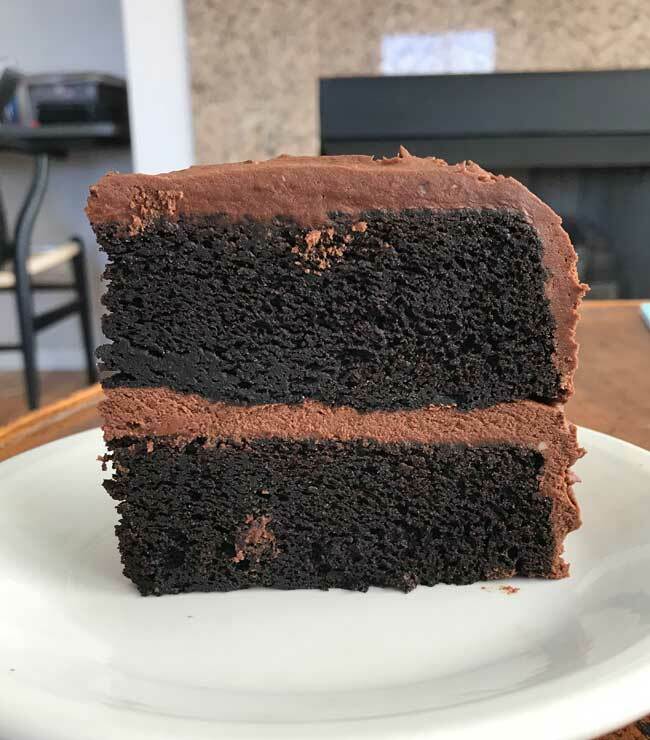 Anna, this is my favorite chocolate cake -I’ve made it several times and absolutely love it. I’m making it again today for a party but I’m out of Hershey’s Dark, can I use natural unsweetened (in the cake)? Thanks! Jackie, that is cool. Did people know it had stout in it? Darla, I think it would be great with coffee instead of beer. You could also try it with coke or Dr. Pepper. It would be a little sweeter, but not much…the cake’s not overly sweet to begin with. When I got married in January we had this cake as our wedding cake. BEST chocolate cake ever!! That’s great news! I’ve been baking for years and am still sensitive to comments made about whatever it is I’ve served. It’s really great when a recipe works out perfectly and everyone notices how good it is. I’m glad you liked this one. I did too. It really stood out amongst all other chocolate cakes. While I want to be good at making cakes, I always seem to run into problems (they come out dry, fall apart while trying to assemble, get too crumbly while frosting), and therefore don’t have a lot of confidence when it comes to baking cakes. Now that I know I can make a good cake (this one), maybe my confidence will grow and I will try more! Thanks for sharing this winner! Thanks for the quick reply, Anna. I am just back from dinner out. Tired but going to rally and frost tonight! I’ll let you know how it turns out! I’d frost it this evening, cover the cake with something, and refrigerate it until tomorrow. It’s such a moist cake that it will stay fresh for a few days and the refrigerator won’t dry it out if it’s covered in frosting. Anna, I am making this cake for a party tomorrow. The cake is out of the oven (batter was delicious!) and I am trying to figure out how to store it until tomorrow. Should I frost and assemble later this evening, then refrigerate the whole cake, or should I just wrap the layers, make the frosting tonight, refrigerate that, assemble and frost the cake tomorrow? Or something else entirely? I don’t bake a lot of cakes so I don’t know what’s best. Thanks! This looks great! I made something similar but used a double chocolate stout instead of Guinness. I’ve been thinking about trying it with other beers. One last comment – this cake is awesome! We’re not Guinness drinkers here and I ended up going to The Fresh Market to find it and had to buy a 6 pack. It was so worth it. Thanks for posting it, Anna. Thanks for the quick reply, Anna. The cake is cooling as I type this. Can’t wait to try it! BTW – I happened upon your blog last week and have added it to my GoogleReader blog feed. Thanks for the awesome recipes! Yes, 2 stick (8 oz) is correct. I didn’t find it too thin or too buttery. However, frosting is a personal thing, so adjust the sugar and liquid to your liking. I’ve just put this cake in the oven and can’t wait until it comes out. Do I read the recipe correctly on the amount of butter in the frosting? Is that 2 sticks? I wondered if that amount might make the frosting too thin. wow. this might be a good one to bake for a coworker’s farewell party next week! thanks! *sigh* I really miss being able to have chocolate. This cake looks fantastic! Great idea using Dutch in the cake and natural cocoa in the icing. Yum!!! I LOVE Guinness and the picture is amazing, the cake looks so moist and delicious! Great recipe! And the photo looks soooo enticing. I have a Guinness cupcake with espresso frosting recipe that I really like, but I would try this one next time I want to do a big chocolate cake. I tried a Guinness cake several years ago and was less than pleased with the results (tasted bitter to me) but your picture (amazing how a good camera can produce amazing images) is encouragement to try this cake again. I have to say I love Guinness Brownies (recipe can be found on About.com). MMMMMMMMMMMMMMMMMMMmmmmchocolate AND Guinness- my two favorite food groups! Your cake is beautiful, Anna! And I’m sure that frosting will be useful for a number of other cakes. Hi Amy!! Good idea about the extra batter. For our purposes, halving worked out really well. Christy, it’s funny that you should mention Texas Sheet Cake because I almost made that. However, I wanted to make something new and since we had the Guinness, wel…. Chelsea, this one’s tried and true. If you do a Google search, you’ll find some other variations. Thanks, Shannon. I’m having so much fun playing with lights and angles now that I have a better camera. Hmm, I’m not a big Guinness fan, but my hubby is. His b-day is in April, and I’ve been wondering about cakes/brownies w/Guinness. Maybe I’ll give it a try! The close-up picture looks like you could stick your finger right in the frosting and steal a taste! I have never heard of Guinness in my life. Any chocolate cake is good but I especially love Texas Sheet Cake. I made this for Gary’s birthday one year. I agree, it’s great. I put the extra batter into cupcakes. Good story! You’ll have to show me your Ireland pictures one day. I’ll save you some cake. Guinness cake – that’s something I can get behind!